My cardinal rule since starting this blog back in 2015 has been simple: vintage only. Very occasionally I’ve veered away from that, when reviewing books that cover both vintage and modern He-Man toys, for instance. But even then it was really just in passing. So why start now? It’s not because I’ve exhausted available material about the vintage line. I’ve covered just about everything that came out from 1982-1984, but there’s still a lot left from 1985-1988. Frankly, I’m starting to feel a little burnt out, and I’d like a change of pace. The Masters of the Universe Classics line (2008-present) is actually what drew me back into the world of He-Man and helped me to develop a more discerning eye for the kinds of things I talk about in this blog. The Classics line is an interesting mix of influences, and fans have always hotly debated which influences they thought ought to go where. Still, I’m not going to do a traditional action figure review – there are a ton of people who have been there, done that much better than I could (Pixel Dan, The Fwoosh, Poe Ghostal, etc.) Instead, I’ll briefly discuss specific design elements and their source material. 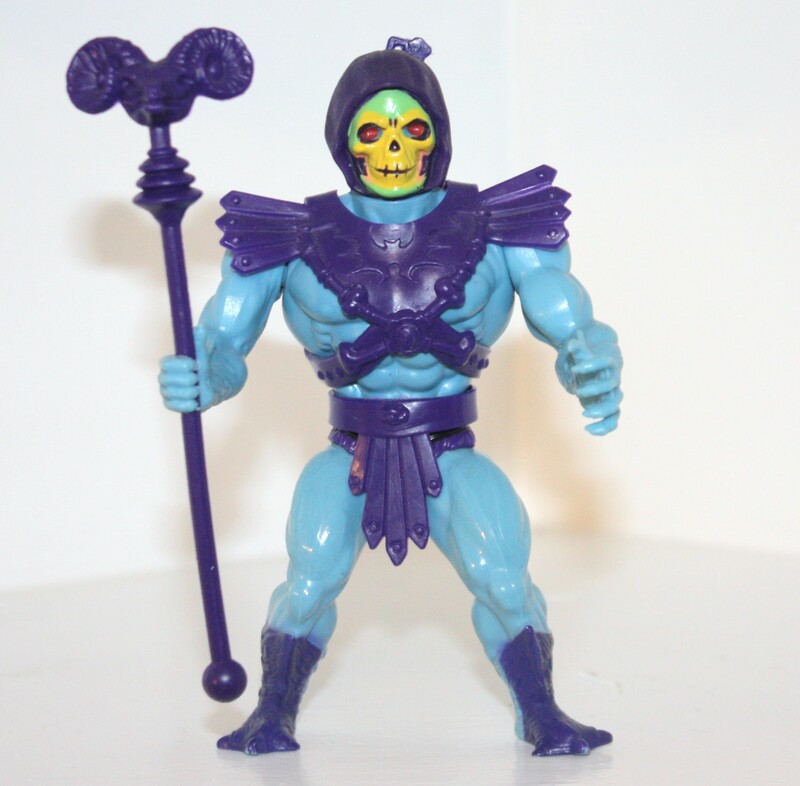 The first Classics Skeletor was released in January of 2009, and has been reissued a couple of times since. However, I’ll focus for now only on the 2009 Skeletor. The Classics line is generally based on vintage source material (principally toys and cross sell artwork), but in a larger scale with modern articulation and more realistic proportions. These figures are sculpted by the artists at Four Horsemen Studios, who put a great deal of care, planning and artistry into their sculptures. Simplified face paint (compared to the vintage toy). Note that this varies from figure to figure. First issue vintage toy with purple trunks. Reissue vintage toy with black trunks. 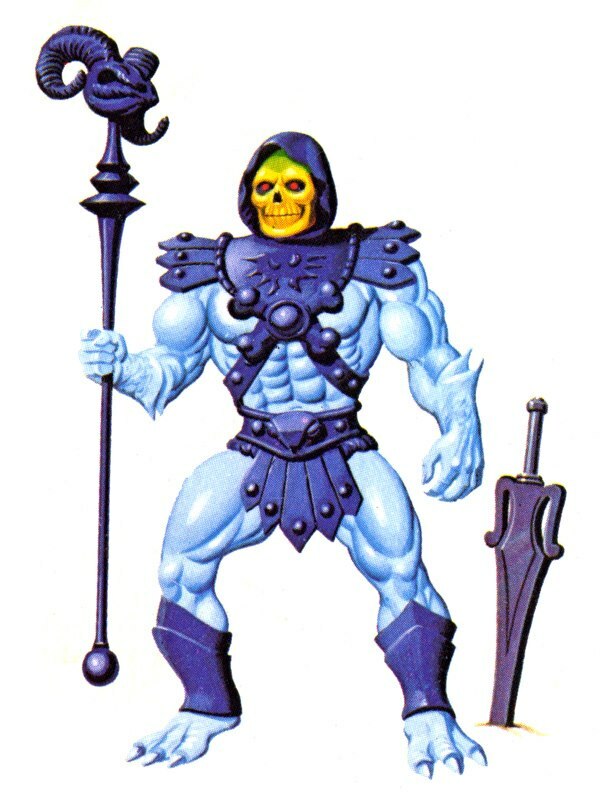 I do think the center of Skeletor’s belt is misinterpreted. It’s a stylized bird head in the cross sell artwork (and even more clearly a bird head in the original B-Sheet), but it seems to have lost any of that look in the Classics figure. And that’s about it for now about MOTU Classics Skeletor. Let me know what you think. I’d like to know if there is interest in more articles like this one, or if you all think I’m crazy and should get back to purely vintage material. Thanks to Dušan M. for informing me that Skeletor’s hanging “skirt” is called a baltea. Hello bro! I would love to see more articles like this! I’m very interested in small details and such. Example- why do some vintage skeletons have only half of the feet painted? Why did they change Clawful and Whiplashes’ feet from the cool extra beasty versions? What’s up with roboto’s purplish parts on his legs? And yes, I’d love to see you do a vintage Clamp-Champ! I’ll see you Twitter soon! Take care! personally, I don’t really like the Classics range.. I would have just preferred a more faithful version to the original toys. Sure, increase the size, add more details and joints, but you can do that without changing things greatly like adding stuff where nothing was meant to be (some people don’t like to ever see a plain area, they all must be detailed).. but each to their own. These don’t always suffer as much as some ‘remake’ classic range toys do. My opinion of Classics has been all over the place. Years ago I was always wanting them to be exactly like the vintage toys, just with sharper detail. Now that my vintage collection is more robust, I find myself more interested in cardback/minicomic influences. I’m all for more posts like this, as the comparison between the vintage and Classics figures are endlessly interesting to me. (I always do comparison photos of the two in my own MOTUC figure reviews for that reason. Skeletor was the one I covered last week, coincidentally!) I agree about the belt ornamentation. They made it look pretty much exactly as it does on the cross sell art, but I would have preferred that they extrapolate the additional detail from the B sheet design there, since it seems that was one of those things that was altered due to limitations in the manufacturing process of the time, rather than an aesthetic decision. I can’t fault them for not doing that, though, since they did nail the look of the cross sell, which was their goal. 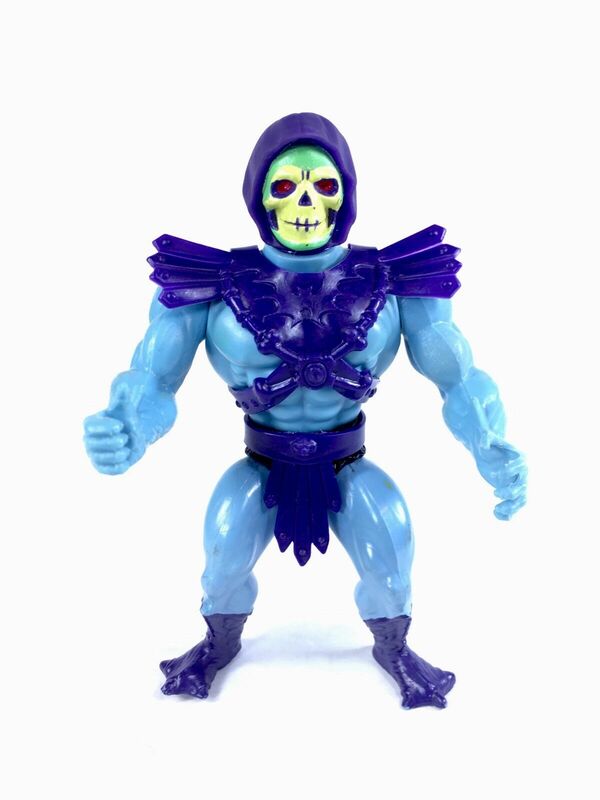 I still want a full-on B sheet Skeletor figure, though. I know I mention that whenever it comes up, on the .Org as well, but I’ve been waiting for many years now, dammit, haha! I’m always looking forward to your posts and although I’m not a collector of the Classics line I thought this was interesting and a fresh way to look at the new line. It’s your blog, and you should feel free to do whatever you want with it! Be sure to know that I will follow your future post with great interest, whether you write about MOTU Classics or not. Take care! Great post as usual. I love the classics line as it’s what got me back into MOTU. I didn’t bother with the 2002 line or cartoon as when it aired it seemed to never be on when I could watch it here in the UK. The toy line didn’t appeal to me (maybe an age thing as I was 19 at the time and hadn’t got into having action figures about as an adult then like I do now) but I’ve liked the classics take on that line. I would deffo enjoy more classics stuff on here.